Danny Sands was a good friend of mine, a fine, caring man to me in my early stunt career, a long time veteran in the business before I ever met him on “Rio Lobo” when we were both on location at Old Tucson in ‘70. Sands’ first stunt job was in ‘39 on “Arizona” starring William Holden. A patriot to the core, Danny enlisted in the Army shortly after Pearl Harbor and was in for five years, seeing combat in the South Pacific. Danny had been working with John Wayne and director Howard Hawks since “Red River” in ‘48, his first film following military service. Hawks was very fond of Danny’s outgoing personality, always making sure he got a role in most of his films. It was director Hawks who brought Danny into the film business way back in ‘37 when he started work at Monogram. Hawks met Danny at the racetrack where he worked breaking horses for Hawks and others. Danny recalled, “On the Hawks pictures, the old man used to like to make me sick—he’d give me little parts and that would make me sick. I just didn’t like to do it. I practically wet myself about it.” This is never more obvious than in George Plimpton’s documentary, “Shootout at Rio Lobo”, in which Sands is interviewed and shown screwing up a take several times. Born in Carlsbad, NM, in 1914, after hitting Hollywood in the late ‘30s he was rarely out of work. 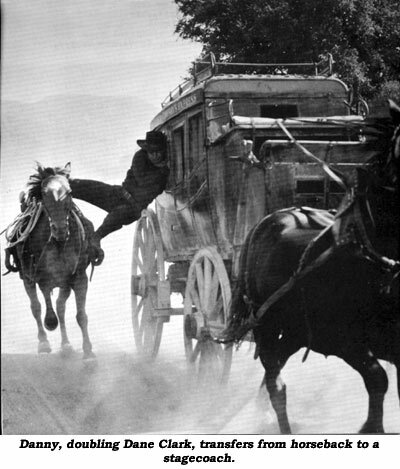 An excellent horseman and scrapper, Danny was kept busy for almost 60 years in Hollywood. He doubled Lloyd Nolan, James Cagney, Ingrid Bergman, Barbara Stanwyck, Henry Morgan and others in his long career. Some of Danny’s more famous credits include “Run For Cover”, “Tribute To a Badman” (both with his good friend James Cagney), “Shane”, “The Robe”, “Bad Day At Black Rock”, “Fort Apache”, “El Dorado”, “Hallelujah Trail”, “Hombre”, “Hawmps”, “The Wild Bunch” and Wayne’s “The Undefeated”. Few TV westerns were made without Danny’s input including “Maverick”, “Colt .45”, “Nichols”, “Rawhide”, “Gunsmoke” and “Lawman”. Danny was never happier than when he was on the set kibitzing with the guys. As time and age took their toll, Danny kept working as a stand-in and extra just so he could be around the business. He called everyone “Honey”, man or woman, even the biggest stars got the familiar greeting. He said it was so much easier than trying to remember all those names. Sadly, at 83, Danny Sands passed away in Toluca Lake, CA, January 7, 1998. He was survived by his wife, Susan, and a whole industry that was glad to have a great stuntman and genuine character like Danny Sands in its midst. Danny was inducted into the Stuntman’s Hall of Fame in Moab, UT, a justified honor for a man that gave six decades to the westerns we admire so much.